Kathy Escamilla is a professor in the Division of Educational Equity and Cultural Diversity at the University of Colorado–Boulder. Her research interests center on biliteracy for Spanish/English emerging bilingual children in U.S. schools. Escamilla's career in education spans 45 years; she has written three books and published over 50 articles. Escamilla has been a teacher, resource teacher, bilingual program director, and professor. Susan Hopewell is an assistant professor of education in the division of Educational Equity and Cultural Diversity at the University of Colorado–Boulder. She is interested in issues of language, culture, equity, and identity, especially as they affect—or are affected by—literacy practices. Prior to becoming a professor, she spent 12 years as a classroom teacher and literacy specialist in bilingual elementary schools. Wendy Sparrow is a professional research associate at the University of Colorado–Boulder. Her research interests include the bilingual literacy development of Latino elementary school children and fidelity of program implementation in bilingual and dual language programs and interventions. Before becoming involved in research, she spent seven years as an elementary bilingual classroom teacher and Title I literacy instructor in the public school setting. Lucinda Soltero-González is an assistant professor of education in the Division of Educational Equity and Cultural Diversity at the University of Colorado–Boulder. She was an elementary school teacher and a bilingual special education teacher for over seven years before earning her Ph.D. in language, reading, and culture from the University of Arizona. Her research interests include the development of bilingualism and early biliteracy in young Spanish-speaking children and biliteracy practices in U.S. schools. Olivia Ruiz-Figueroa worked in the Tucson (AZ) Unified School District for 22 years. She is one of the original authors of Instrumento de observacíon, the Spanish reconstruction of Marie Clay’s Reading Recovery program and assessment. 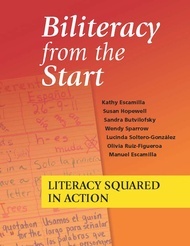 She co-authored Evaluacíon del desarrollo de la lecture, the Spanish version of the Developmental Reading Assessment, and has worked with Literacy Squared since its inception. Growing up in a bilingual/bicultural home, she continues to focus on assessment, instruction, and cultural equity for emerging bilingual students being educated in the United States. Manuel Escamilla earned a Ph.D. in curriculum and instruction with an emphasis in early childhood education from the University of Kansas. He has been a Head Start program director and has spent most of his professional life working with parents to improve the higher-education opportunities for their children. He is a project director for the BUENO Center for Multicultural Education at the University of Colorado–Boulder.